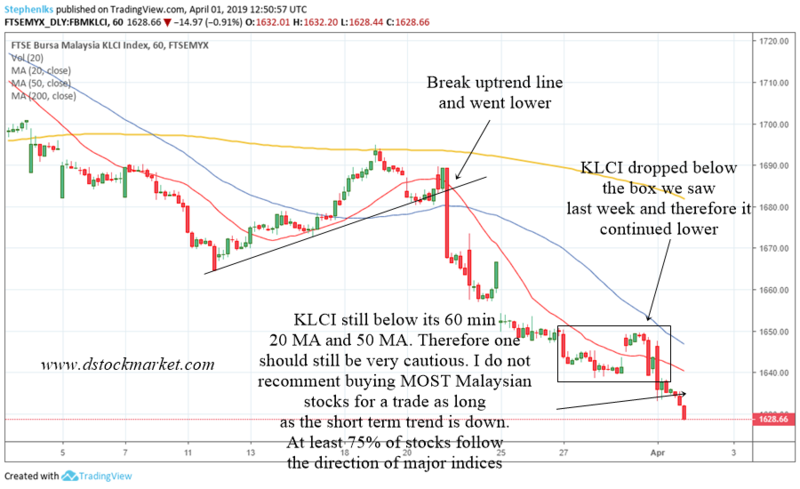 In this page you will find analysis of the KLCI for the month of April. I update it almost every trading day so if you want the latest, you will have to press the refresh button. The latest analysis is on top while the older ones will be at the bottom. 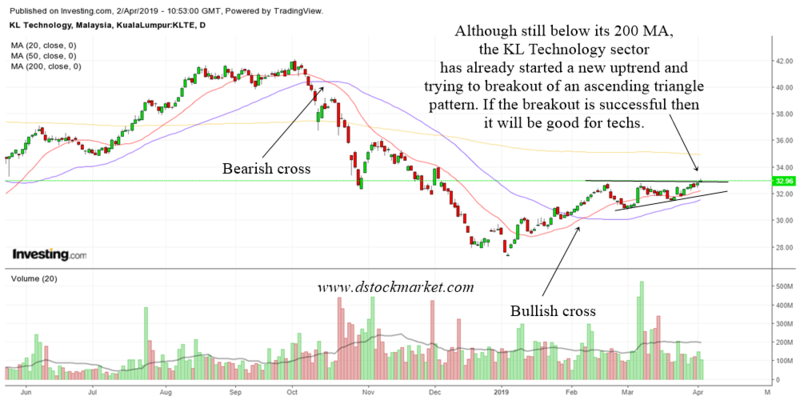 I will also upload analysis of certain Malaysian stocks here. Some of them are hot stocks and some of them are requests by members in my Telegram group. So hopefully it helps you as well. It is great news to hear that Malaysia will continue the ECRL contract with China. Though I must say that I think there is no need to reduce the scope of it. I think there is no link to Bentong. Some of you know that I live there. So, well...a bit dissapointed. Anyway, the more places that ECRL connects too the better it will be for the economy of Malaysia. Especially since one of the biggest income for us is tourism. Spending more money on it will yield more dividends for us in the future. The news of the continuance of the ECRL I think lifted the market a bit but not the super rise. This told us that investors are still not very confident with the Malaysian economy. But perhaps as time goes by we will be able to see things clearer. 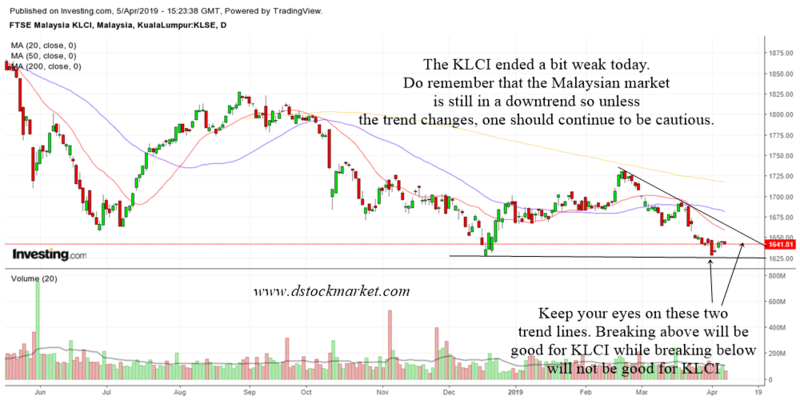 From a technical perspective if you really want to see a better Malaysian market, you really need to see the KLCI break back above the daily downtrend line. Otherwise I must say that I still do not have that much confidence in the Malaysian market yet. While the US market has risen, the KLCI is still very weak. Do remember that our market is still in a long term downtrend. Therefore investors and traders should continue to be cautious and only play the best candidates available. It is in these times of testing that the skilled trader is separated from the others. In a bull market, almost all boats will rise and people can mistake themselves for being great at trading. But in a bad market, it takes skill to find the best trading candidates. 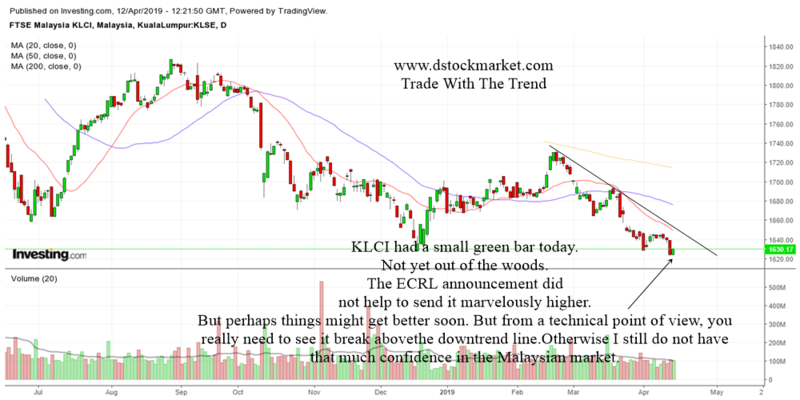 There are two very important trend lines that you should have a look at the KLCI. One if the downtrend line and the other is the horizontal support line. Whichever the KLCI breaks will give us a hint where it wants to go. Bearish or bullish. 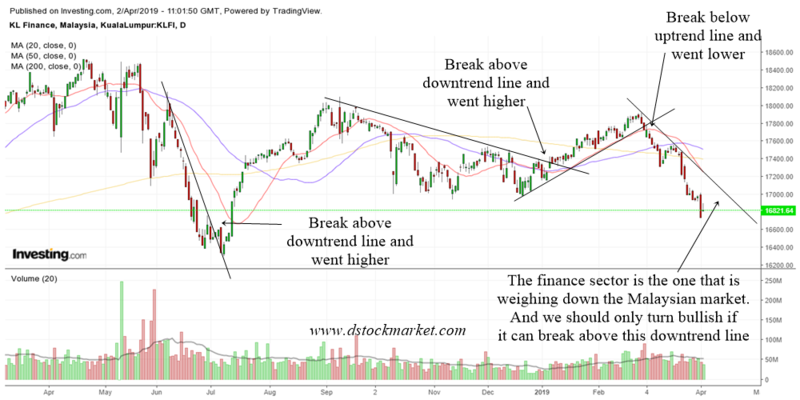 A break above the downtrend line will tell us that the market might get better. Though for a true start of a bull market we need to at least see it trade back above the daily 200 MA. 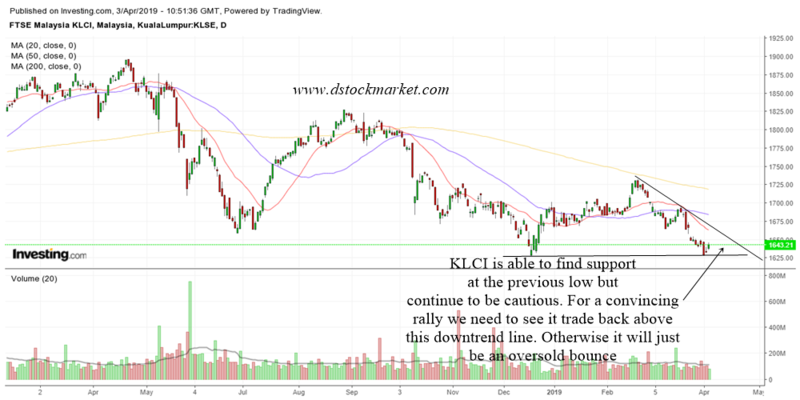 If KLCI breaks below the support line, then you can be sure that more weakness might follow. 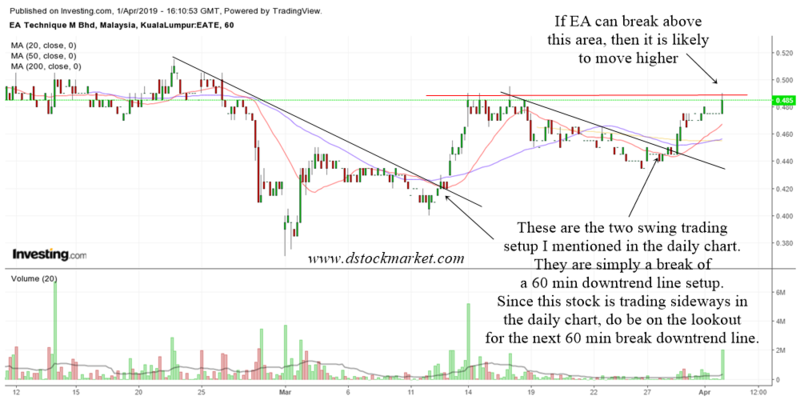 The 60 min chart above shows a lack of commitment from buyers today. Otherwise it would have gone up above the ascending triangle type pattern. It has not gone below yesterday's low yet. But if next week it trades below the low on Thursday then there might be more weakness. 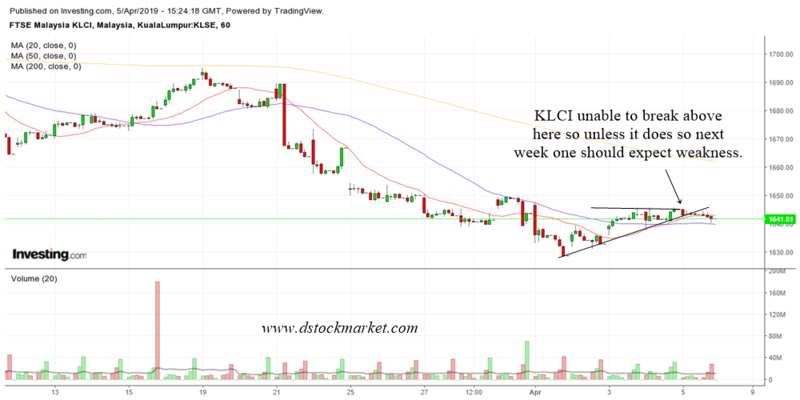 KLCI has to break above the pattern if it does not want to go down. If next week it does not break higher, then more weaknesses might follow. KLCI continues to show some bullishness today. One thing to note is that KLCI is ignoring a large red bar that formed near support. That usually signals some bullishness. Today the market formed a small little bottoming tail. Nothing so significant but it does tell us KLCI wants to show some bullishness. 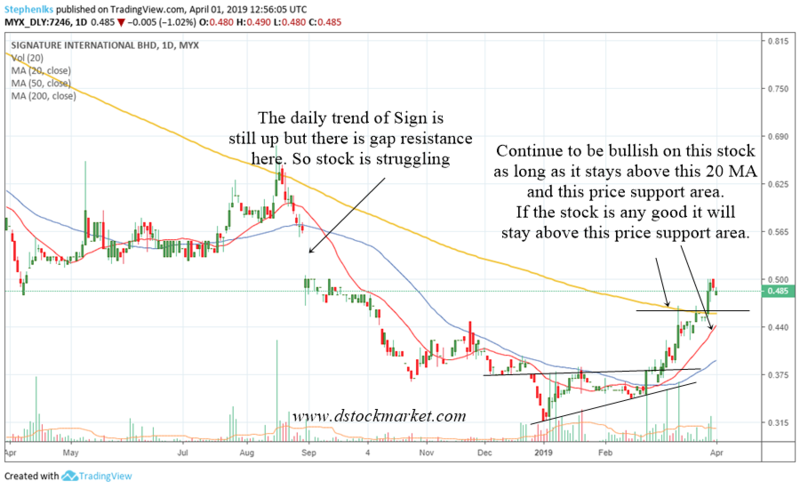 Do remember that we still need to look at the daily downtrend line. 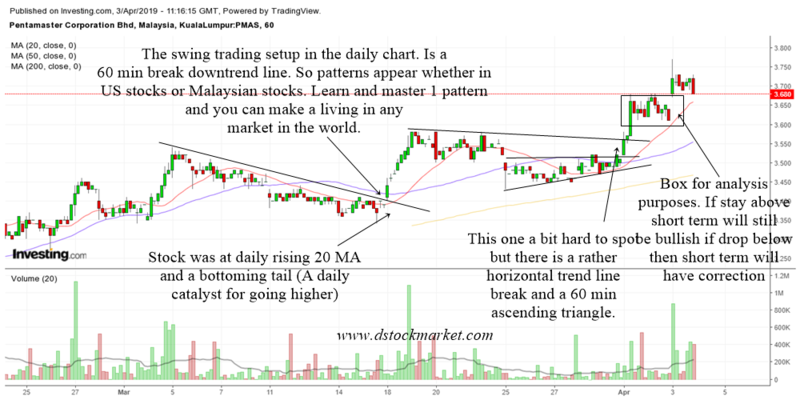 For a sustainable rise we really really want to see KLCI trade back above the daily downtrend line. 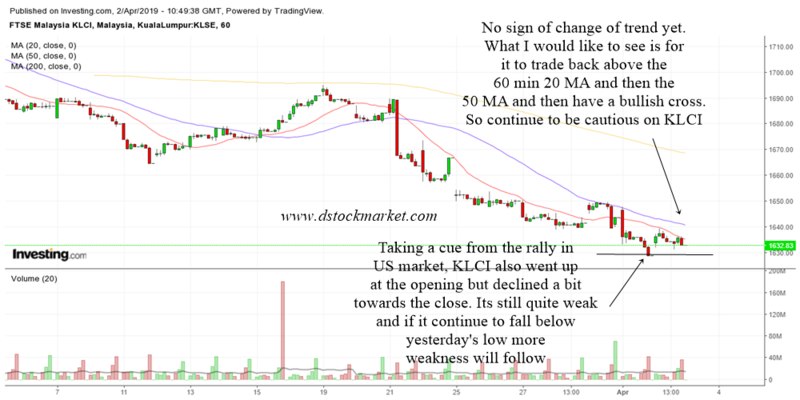 If you look at the 60 min chart of KLIC above you will realize that it has gone back above the 60 min 20 MA and 50 MA. That is a good development. All short term trend changes always begin with the market going back above the 20 MA and 50 MA. 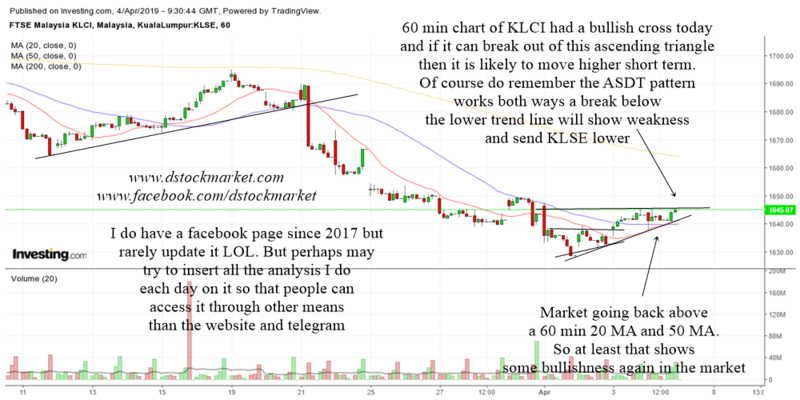 We could say that the KLCI is also forming a 60 min ascending triangle. 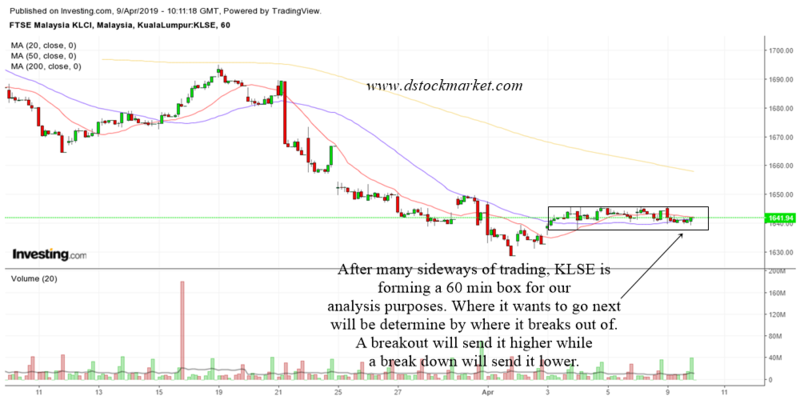 Which if it manages to break out of it then KLCI is likely to go up short term wise. 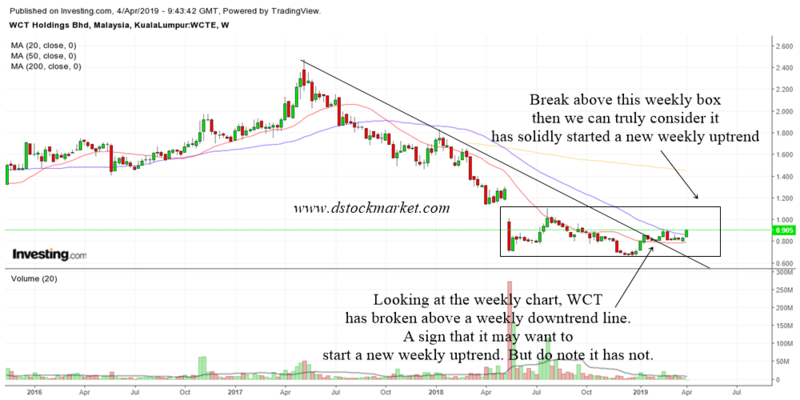 A group member asked me to have a look at WCT. 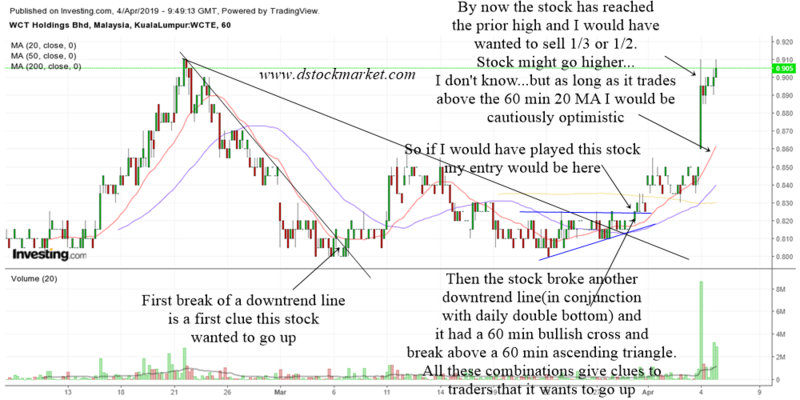 Well the big rise and heavy volume today will no doubt draw a lot of attention to this stock. Well it might or might not go up more tomorrow but my advice will not to enter now. The reason is because it has gone up quite a lot for swing trading purposes. If you are an investor well...that is another story because you might have your own reasons to enter. 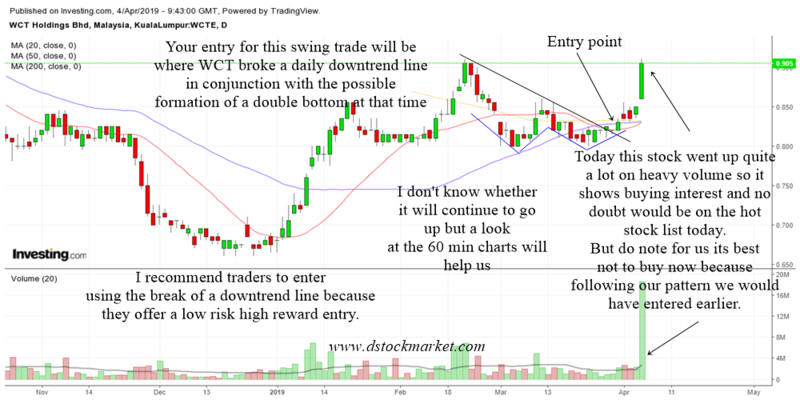 The correct entry point for this stock for the purposes of swing trading was when WCT broke a daily downtrend line. 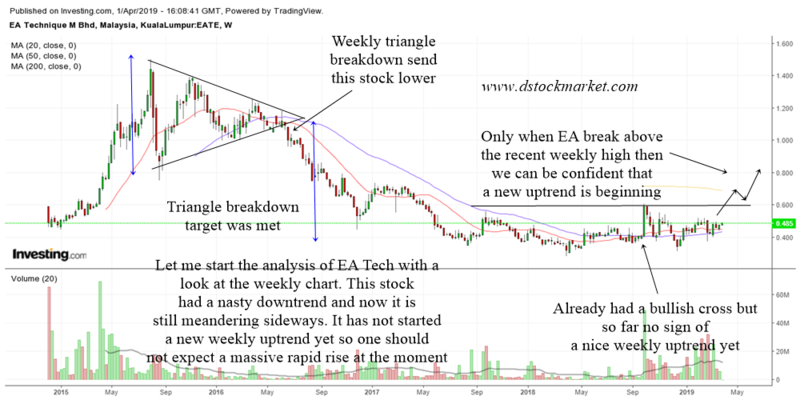 Do have a look at the weekly charts and the 60 min chart below to understand how this stock went up. Well, today the KLCI bounced back up. So far the daily support at the previous low is holding. The large bearish candle that traveled down to the support area may be some panic selling or climactic selling. This can often happen right near the bottom. Although support did hold one should continue to be cautious on the Malaysian stock market because the trend is still down. And KLCI is still below the 200 MA. I have mentioned this in the past. 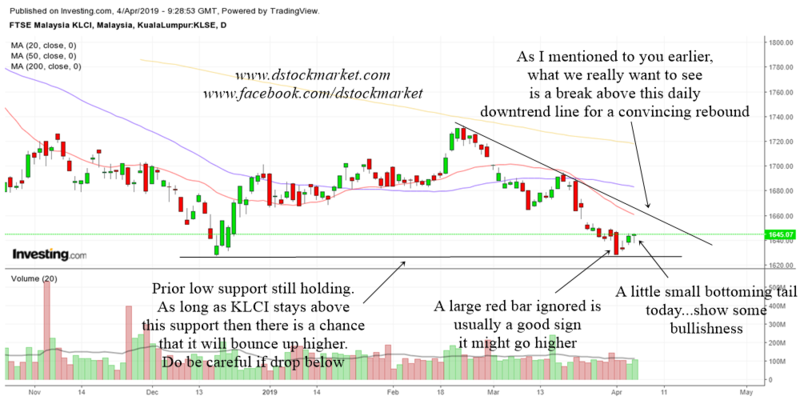 For a convincing rally / rebound, KLCI needs to trade back above the downtrend line that I have drawn. Otherwise it will just be an oversold rally. Then the market will continue to go lower. 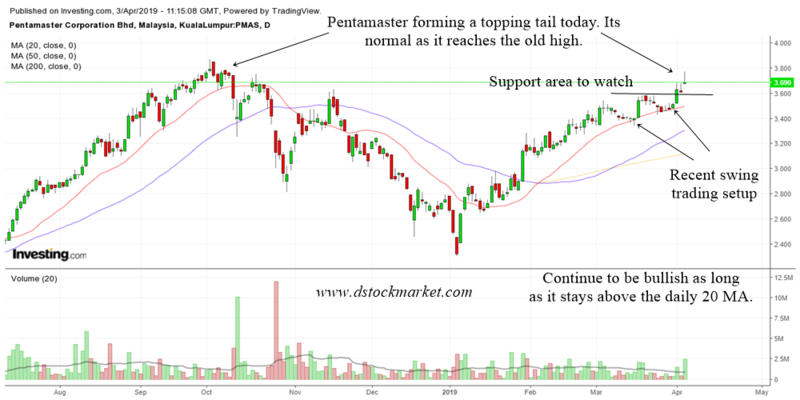 I have included charts of Pentamaster here. I think I will also put it later into its own page. 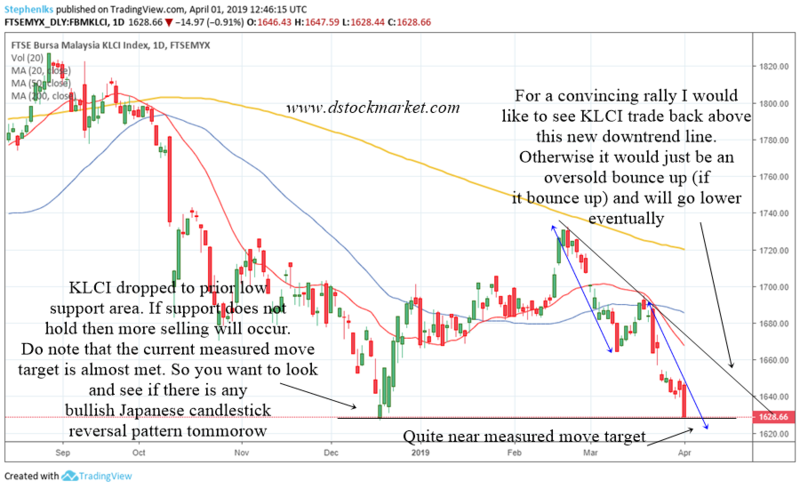 But for those who look at this KLCI analysis I will also put in charts of individual stocks that I have analyze here for your convenience. I must say that Pentamaster had quite a superb recovery. It formed a topping tail today. Not necessarily a reversal signal since it is at former highs. Perhaps a signal that the bulls are a bit tired. 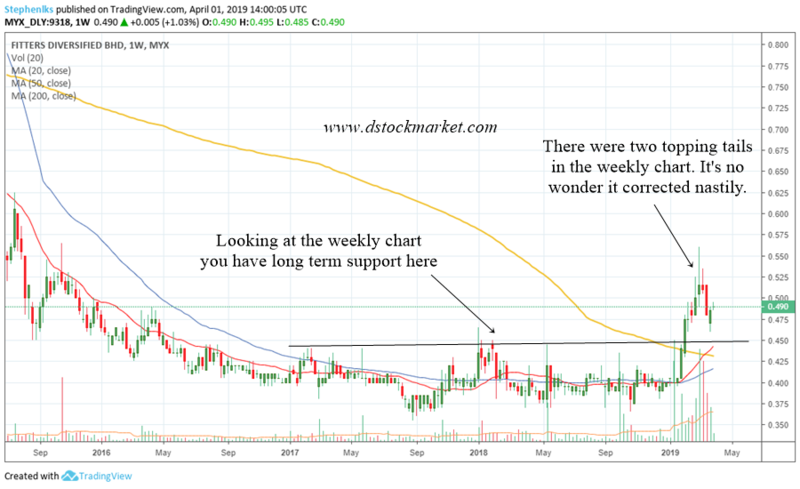 Continue to stay bullish on this stock as long as it is above the 20 MA. 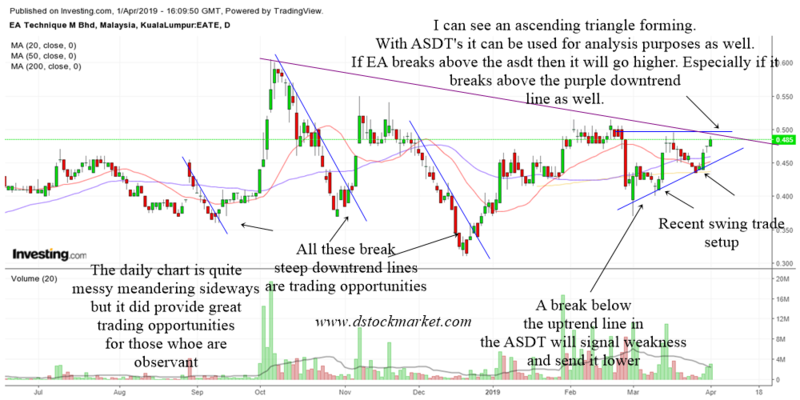 There are always swing trading opportunities when a stock is in an uptrend. 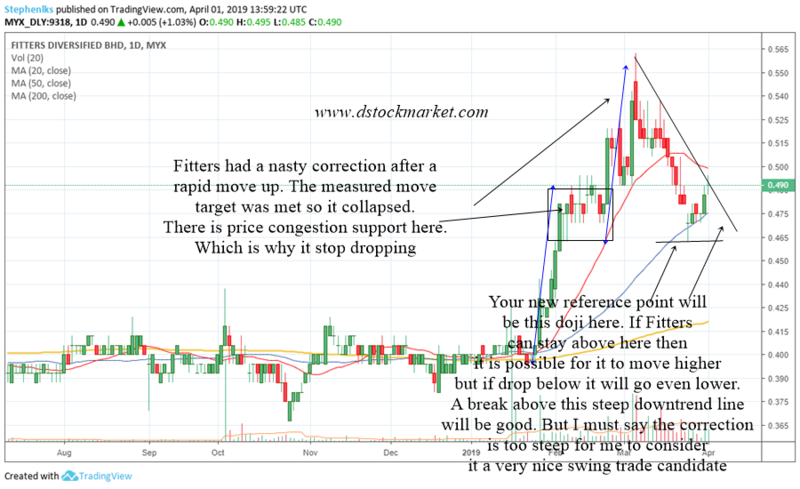 And as you can see, when Penta drop to its 20 MA, it provided 2 recent swing trades. 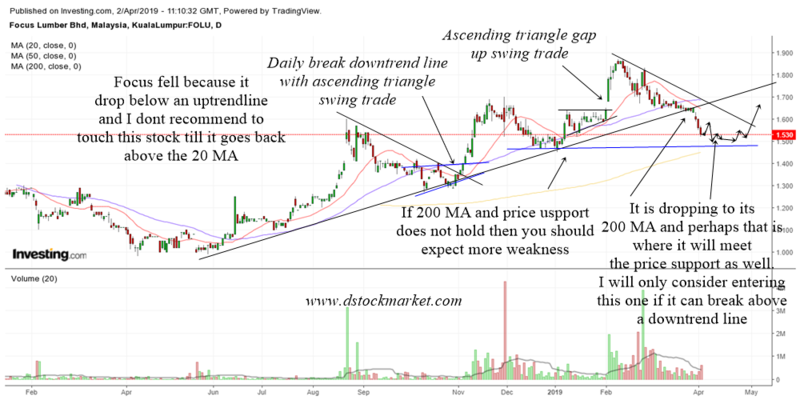 Always be aware of trading opportunities when a stock that is in an uptrend drops to its 20 MA. 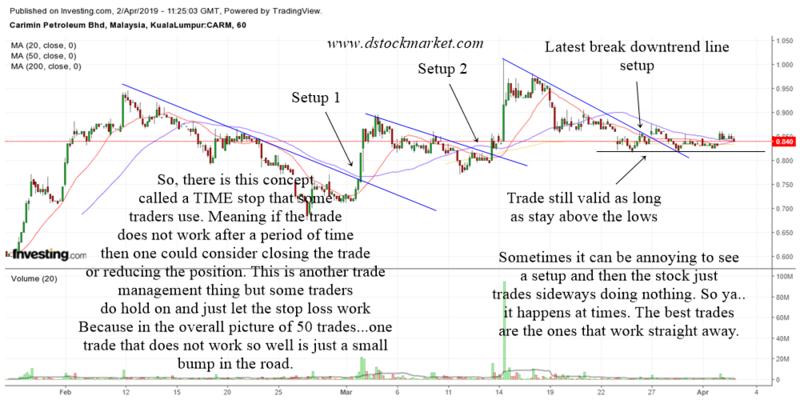 Read the 60 min chart annotations below for more information. Our Malaysian market opened higher today. Thanks to the sentiment of bullishness around the world. However it could not maintain the speed and later closed lower. I was expecting a bullish harami in the daily chart but because it closed lower there was not valid bullish harami. 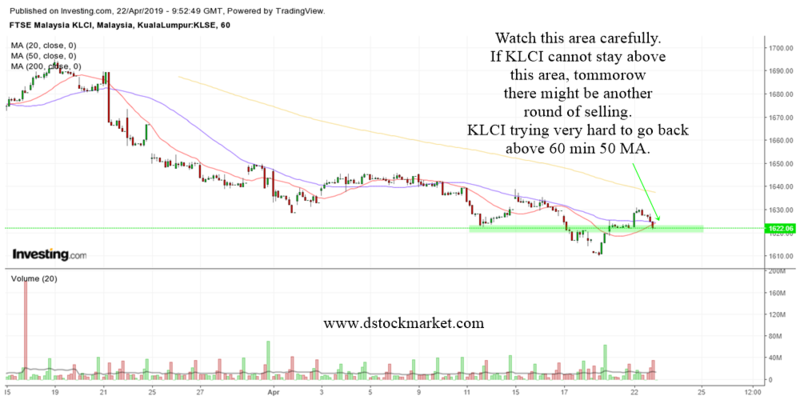 Therefore we will have to look at the 60 min chart of KLCI to determine the future direction. 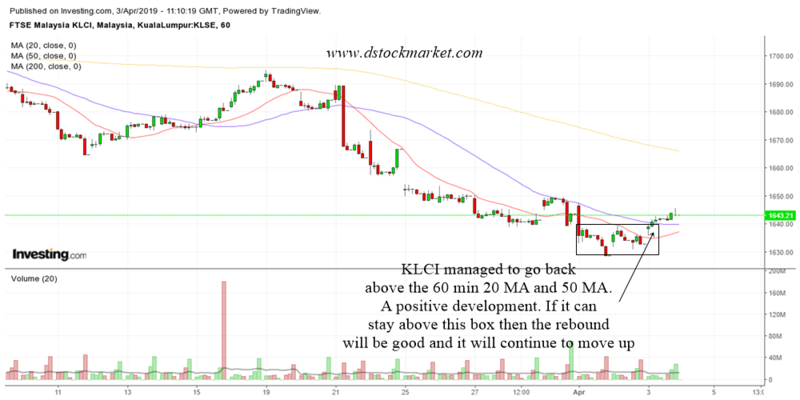 Currently it is still below the 60 min 20 MA, 50 MA and 200 MA which we want to see KLCI trade back above before being bullish. I have attached the analysis of the construction sector, the finance sector and tech sector. 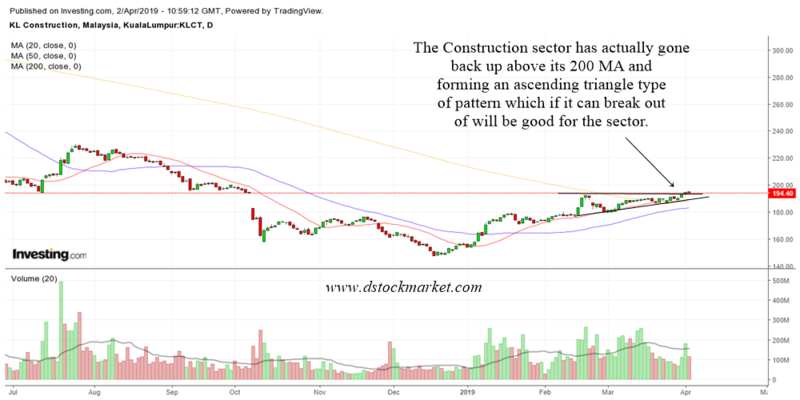 The construction and tech are stronger and looks set to break higher. But it is the finance sector that is weighing down the entire market. I find that the KLCI is very very weak compared to other world market indices. 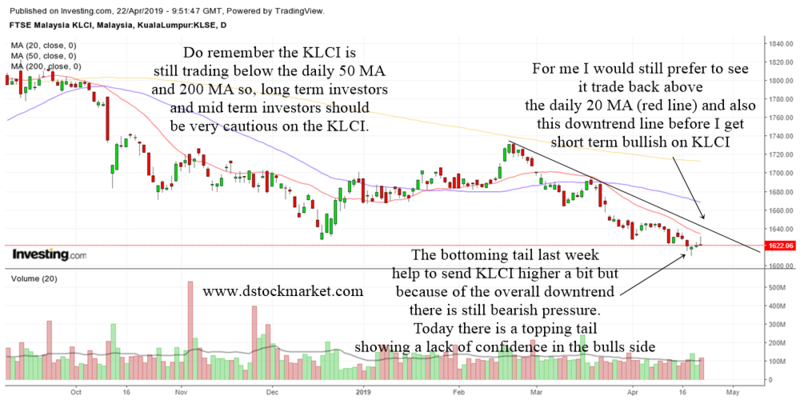 I think the local economy is not doing that well hence the downtrend in the KLCI. 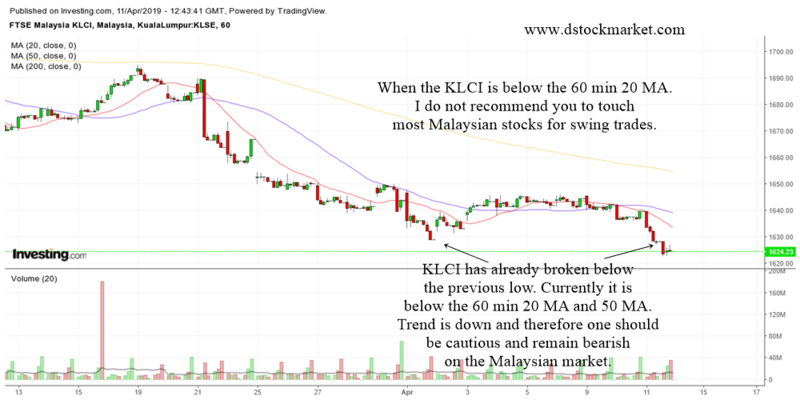 The KLCI is still in a daily downtrend and you will notice that the KLCI is still below its declining daily 200 MA. Therefore, the long term trend is down and it will affect many local stocks. So one should be careful with Malaysian stocks. When the local market is weak, one should be very very selective in choosing counters to trade. Only select stocks that are above their daily 200 MA. Preferably in an uptrend. 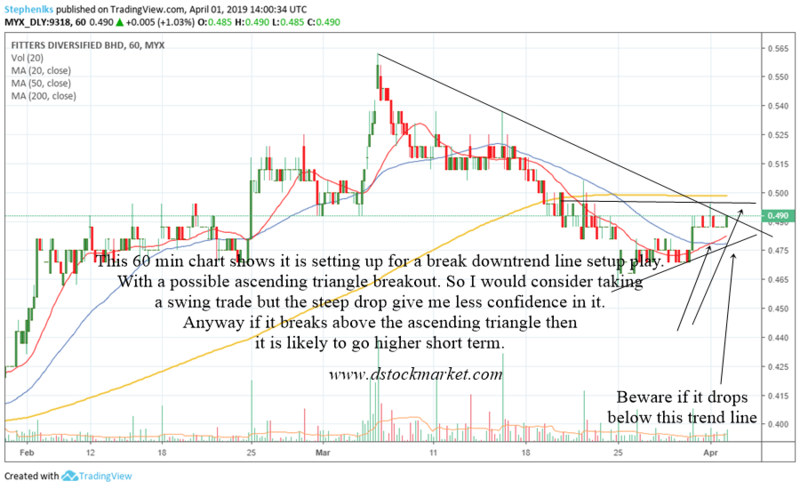 That way you will be having the trend of your stock to be up.